Producing radium isotopes to treat cancer could get easier. Researchers developed a method to recover medical radium isotopes. 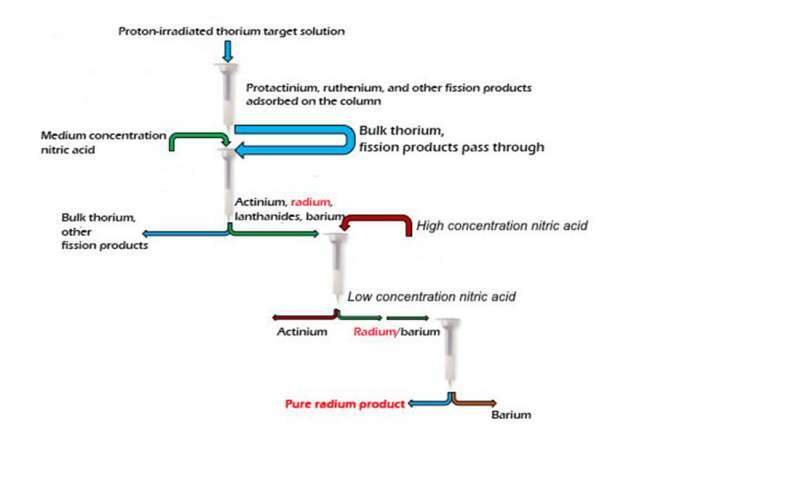 The process begins with the dissolved proton-irradiated thorium target solution. The process then takes the solution through a series of columns. In each column, different isotopes bind to the different substrates the column contains. With the anticipated scale-up to large thorium targets, dozens of patient treatment doses would be available for recovery from a single production process. Los Alamos National Laboratory's Isotope Team devised the method with collaborators from Brookhaven National Laboratory and Oak Ridge National Laboratory. The improvements result in high product yield and high purity for the isolated radium. The process is modular. This allows integration into an automatable multi-nuclide recovery flow sheet. Radium is now isolated from the same experiment as therapy isotopes actinium-225, protactinium-230, thorium-227, and uranium-230. The results appear in the Nature publisher's open-access journal Scientific Reports. The study was selected as one of the top 100 read papers. It was chosen from more than 5000 chemistry papers published in 2017. Radium is a bone-seeking radioelement, due to its chemical similarity to calcium, the main component of hydroxyapatite, the bone mineral. Radium is thus "mistaken" for calcium in the body, which lets it accumulate in rapidly forming cells in bone metastases. Once incorporated into the cancer cells, the emitted alpha radiation promotes cancer cell death. Radium-223 is the first alpha-emitting isotope that obtained Food and Drug Administration approval for the treatment of cancer. Other radium isotopes of interest for preclinical research include radium-224 and radium-225. Researchers developed a novel methodology for the automated recovery of these radium isotopes from proton-irradiated thorium. Hundreds of millicuries of radium—corresponding to dozens of therapeutic patient doses—can be recovered in high yield and purity alongside other therapy isotopes during the same recovery process. The radium product obtained by this method is composed of radium-223, radium-224, and radium-225 and is suitable for chemistry applications (such as development of specialized ligands that hold radium with high selectivity inside a treatment compound) and possible treatment regimes. Because radium-225 decays into actinium-225, scientists can also use the radium isotope as a "generator" of pure actinium-225 for clinical applications as the other radium impurities do not decay to actinium isotopes.